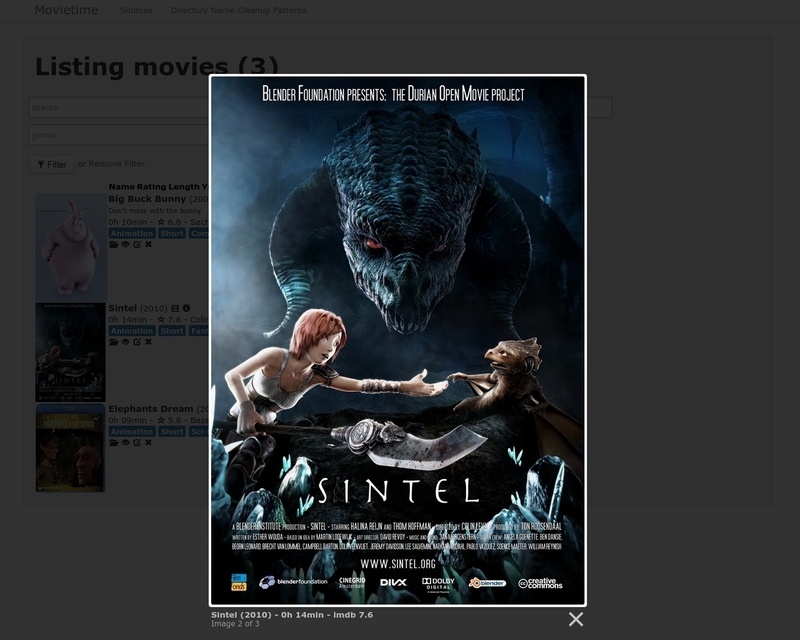 Movietime is a simple and open source (GPL) personal movie database, written in Ruby on Rails. You can specify local directories that will be checked for movies and matched with metadata and a poster images from IMDB. You can also visit Movietime on GitHub. You will need ruby 1.9.3. So you can either visit the ruby webpage or use railsinstaller. Then run bundle install again to install all gems. Now click on Sources on the top and specify at least one directory where you store your movies (for example /home/patbek/Videos in my case). In this directory each movie has to have it's own directory. It will scan your movie folders (Sources) and look up the movies on IMDB for you. You can specify some search & replace patterns for your folder names in the section Directory Name Cleanup Patterns on the top.